With the White House Correspondents’ Dinner coming tomorrow night, things are starting to get zany in Washington, DC. First came the list of confirmed celebrity guests for the affair, which mashed up everyone from Fox News tagalong Jeff Goldblum to the Christian Broadcasting Network’s recruit Candace Cameron Bure and USA Today’s guest Kendall Jenner. 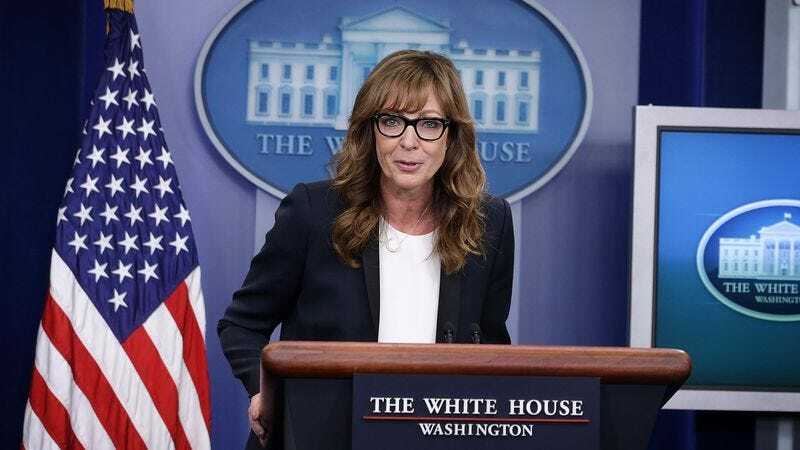 Now comes footage from today’s White House press briefing, which found Allison Janney popping in as her West Wing character C.J. Cregg. While Janney’s appearance was mournfully short, she still managed to slip a sweet reference to “The Jackal” in, giving us another excuse to watch that clip again—and, really, the whole West Wing series, while we’re at it. The White House Correspondents’ Dinner goes down this Saturday night, April 30. C-Span will be covering the whole thing both on television and online starting at 6 p.m. ET.